Picture - Mil Mi-10K of Vzlet in 2006. The Mil Mi-10 (NATO reporting name "Harke") was a Soviet military transport helicopter of flying crane configuration, developed in 1962 from the Mi-6. It entered service in 1963. Also known as "Product 60" by Rostov-upon-Don helicopter facility. 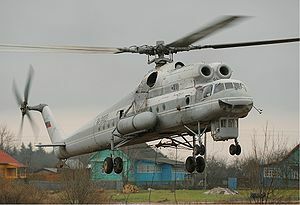 It was built as the short-legged ("Mi-10K") version, and the long-legged ("Mi-10R") version. It is powered by two 5,500 shp (4,100 kW) Soloviev D-25 turboshafts. The Mi-10 uses a closed circuit camera system that scans forward from under the rear fuselage and downward through the sling hatch to watch the payload and landing gear and for touchdown. V-10 - Prototype of the Mil Mi-10 helicopter. Mi-10K (NATO - Harke-B) - Short-legged flying crane helicopter, with a narrower-tracked undercarriage, and equipped with a ventral gondola. (see bg:Ми-10). Mi-10R (NATO - Hark-A) - Standard production model, long-legged flying-crane helicopter. Record setting.